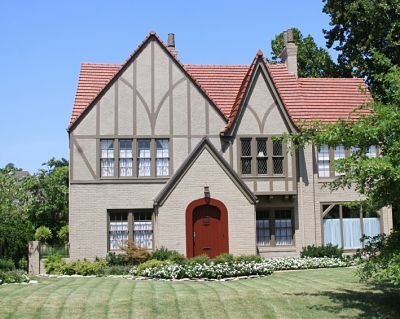 Inspired by design elements of early 16th-centry architecture in Tudor England, the Tudor Revival style made it's way to the US in the late 19th century. Probably the most prominent feature seen on Tudor Revival homes is the half-timbering, which is typically just decorative, emulating the look of the original Tudor homes which were actually built with half-timber framing. Other common design features include cross-gabled steeply pitched roofs, large, elaborate chimneys and embellished entrances.